Books are a great present for babies and toddlers. With a library of favorite stories, you're getting little ones off to a great start by inspiring a love of reading. There are lots of classic stories that everyone loves to give at baby showers and for birthdays and holidays, so I'd like to talk about some of my others favorites. Board books are always a good bet, but consider buying a nice hardcover for their library as well. You'll be helping to create a library that will grow with the child. 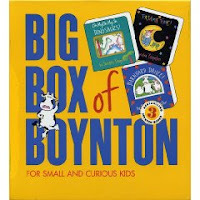 I'm a huge fan of Sandra Boynton's jubilant illustrations and silly rhymes. A personal favorite of mine is The Going to Bed Book, but there are also several boxed sets of her books available that would make nice gifts. Nancy Shaw's Sheep in a Jeep is a big favorite of my baby cousin Nicholas. Fun, simple rhymes and silly pictures make this a fun one to read aloud. Sheep in a Shop, Sheep Out to Eat, and Sheep Trick or Treat are also available as board books. Babies on the Go by Linda Ashman is a sweet book with nice, gentle pictures. It's all about different animals and how they carry their babies. Goodni ght Gorilla is a sweet, nearly wordless story that's a big favorite with preschoolers at my library. There's a gift set available with a board book and a stuffed gorilla. 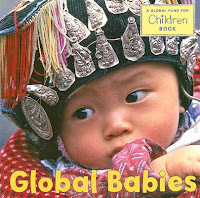 Babies and toddlers love to look at pictures of faces and Global Babies is one of my favorite books of baby faces. Repetitive text and lots of fun animal sounds make This Little Chick by John Lawrence a good choice for babies and toddlers. Hearing and learning about animal sounds helps kids learn to hear the sounds in words, which will help them when they eventually start learning to read. I Kissed the Baby! by Mary Murphy is a favorite of mine for one-on-one sharing. As each animal in the barnyard celebrates the arrival of a new baby they provide an opportunity to sing, tickle, or kiss your own baby. Black and white pictures are easy for babies and young kids to see. Ten Little Fingers and Ten Little Toes by Mem Fox is a very sweet, rhyming story. B abies from all over have many differences, but they all have ten little fingers and ten little toes. 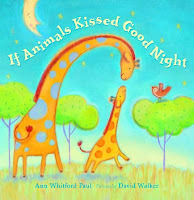 If Animals Kissed Good Night by Ann Whitford Paul is a fun bedtime book with really cute illustrations by David Walker. Before baby gets a kiss good night, read about how animals might kiss good night. Pots and Pans by Patricia Hubbell is a story with lots of great sounds. Baby's in the kitchen with the pots and pans! The fun sounds promote phonological awareness and this is a story to which every family can probably relate. Star Baby by Margaret O'Hair is a simple story that goes through a whole day with mama and baby. Very simple text and a nice rhythm make this book great for reading out loud. 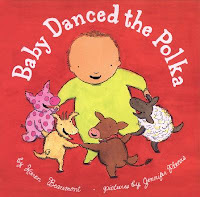 Baby Danced the Polka by Karen Beaumont has great rhymes and fun words to read to your little one. Ignoring naptime, this little baby just wants to dance! These are some of my favorite books for the very young. Some of them are personal favorites and some are favorites of our storytime crowd. I've linked to the books on Amazon.com, but please consider buying them at your local independent bookstore this holiday season! I'm going to order Global Babies for my niece. Thanks! Thanks Abby! I was looking for some good books for my 5 month old niece, these look great. This 12 days of giving is fantastic!!! Great idea and so well written! I love it! Just ordered 3 book for Nicky, one of them from you!Thanks for the help! I loooove your idea to post this! I am just getting buried in friends with kids. So scary!